Spring is here, adn one project that might be on your "to do" list is to finally set up taht composting system in the backyard. Many of us are likely already mulching our gardens and landscaping with wood chips, grass clippings and leaves, spreading them on top of the soil for insulation and to save water, reduce weeds and prevent erosion. While a huge help above ground, mulching doesn’t address the nutritional needs of the soil underneath the surface. Compost is the end product of decomposed organic materials that can be mixed into soil to provide nutrients, loosen packed clay and improve water retention and drainage. In the wild, falling leaves, dead plants and organisms are naturally mixed into soil over time, providing the carbon and nitrogen plants need to thrive. In our gardens, when we weed and collect leaves in the fall, we remove those natural inputs. Fertilizer then is needed to provide adequate nutrition, either in chemical form or from composted materials. Passive composting with yard waste is an easy way to get started, although it will take time to achieve usable compost – from three months to two years. Weeds, grass clippings, leaves and garden remains can be collected in piles or in multilayered holding bins or rotating barrels over the course of a growing season. Equal parts "brown" to "green" waste is a good rule of thumb. If space allows, a second composter can be utilized when the first is full; when the second is full, the first will be ready to dump into the garden and fill again. A location with minimal shade is ideal for your compost pile, as it needs heat to keep going. Over time, the materials will start to decay on their own. Chopping the pile into smaller pieces will help to speed the process, as will turning it regularly, every week or so. Turning the pile speeds up the natural process of decay and produces usable compost more quickly. Compost should not be left to dry out completely (or get waterlogged) and should retain about the same amount of moisture as a wrung-out sponge. You will know when your compost is ready when it resembles rich, dark topsoil and is soft, crumbly and moist. Note that not all of the compost pile will be ready at the same time. This level of composting requires a lidded compost container or bin outside that is safe from hungry scavengers. Kitchen scraps can be stored in a temporary container inside that is then regularly deposited into the outside bin, mixing it in when possible. One tip: most kitchen waste is high in moisture. Adding dry, biodegradable materials, such as cardboard, wine bottle corks, crumbled paper and twigs, will help to add structure and provide aeration. There are several types of composting that require more attention. Most of these are for the advanced composter, but there is one that is an attractive option, even for beginners. Vermiposting (also called vericomposting) uses worms to quickly break down composted materials, leaving behind nutrient-rich worm castings. A vermipost system is small enough to keep on a balcony, patio or porch, so is a good option for those without much outdoor space. 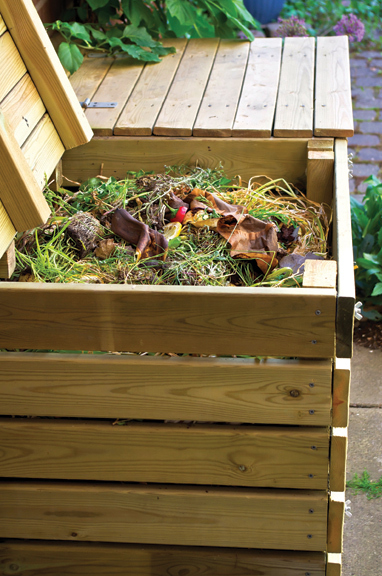 A ready-made kit includes the bin, its alternating layers and the worms, and is one of the cleanest, easiest and quickest composting systems available.